I love this very unique piece of artwork of your's Cett. I can see why this and the original are all really sold. 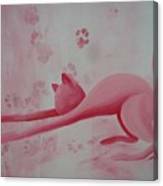 Catt you have playfully and artistically captures the very nature of a cat. One can tell you really love you work because your so expressive with every aspect of your artwork. 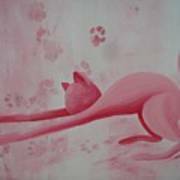 From the lines of movement and lovely made background to the stretch out paws and even the tilt of the head. Alot of the time even as an artist doing artwork we create more artistic work on the canvas then we even try to. Sometimes we will not even see it when were done in till another artist comments on it. What that is, is gift of art with in you. The part you do not have to think about. You are jest born with. We can see it in others but it can by hard to see in are self until someone points it out to us. You night say at that time that wasn't what I was trying to done. Because you do not have to try to do that part or even think about it. That the artist born in you doing that part of the artwork you need even think about. 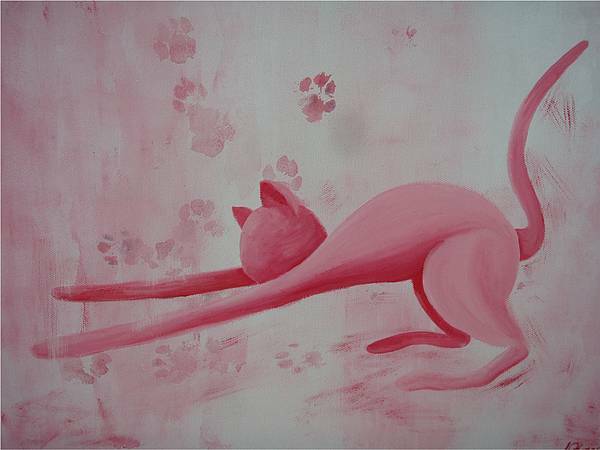 Have fun with you art Catt. You night even find out a little more about your self. Oh yes great title Catt. There's a fun side in all of us. 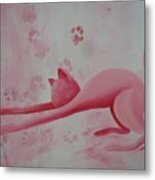 PAUSE is a play on words (paws) the ideas behind the painting are to pause the movements of a kitten. 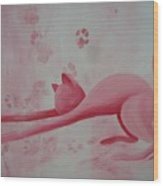 This painting captures them in an awakening stretch and the (paws) prints are courtesy of Hugs! (one of our number of strays!) This painting was a commissioned piece for a lady who adored the original PAUSE painting in greens but also adored pink!! !